Over the last few weeks my second monitor can take anywhere between 3-5 minutes to display a picture, the monitor works and powers on, and has another issue where the OSD menu keeps flashing up and adjusting my brightness and contrast for 100 to 0 and back again. Super Annoying. Although yes, monitors can be had for cheap enough but I want to tackle this issue with my trusty repair skills.. Here's a few pictures of what I found, the internals have now been clean up, and dust free, and there is clearly at least 2 blown caps. 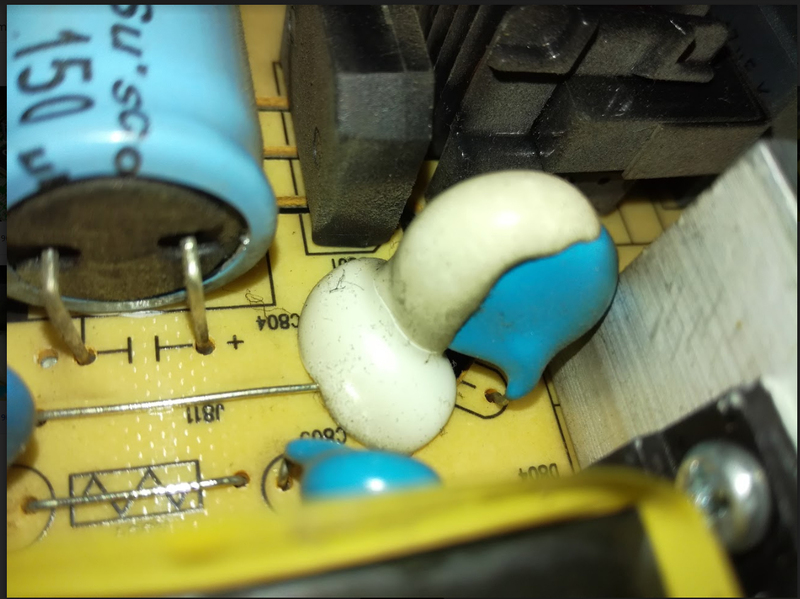 I've added another image to my google drive link 'The Problem 2.jpg' which has the capacitors bulging slightly and a brown center on the one. Off to the local electronics shop tomorrow i think. Before though I'll be listing all the capacitors on the power board and the video board, just incase. The flat round ones are ceramic disk capacitors, only liquid based electrolytic capacitors (The tubular ones) "blow" in the traditional sense, the ceramic ones usually end up in several parts if they do fail. They can certainly go bad, but it's far less common than with the electrolytic ones and usually more obvious. Also when you do replace them, remember the electrolytic ones have fixed polarities(Most caps besides can go in either way), or you'll end up with a few more blown caps (Much more violently this time). Firstly, going back to earlier posts, I had successfully replaced the capacitors and the monitor was booting up as normal (displaying picture with about 5 secs) and was great. 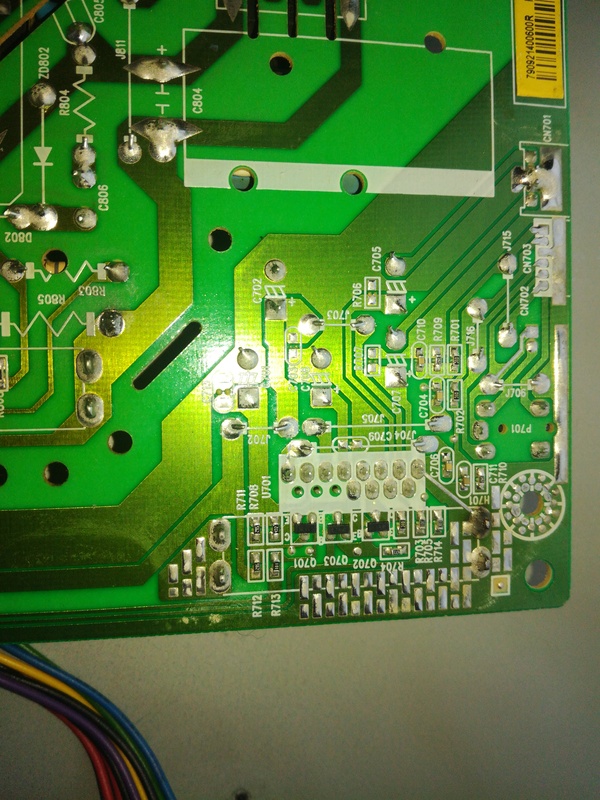 However, the osd was still popping up and giving my issues, I narrowed this down to the small tiny button board itself, so I removed it and checked the board over and cleaned up some of the ming that was on it and it worked great for about 5 minutes before it went back to its normal thing randomly popping up. 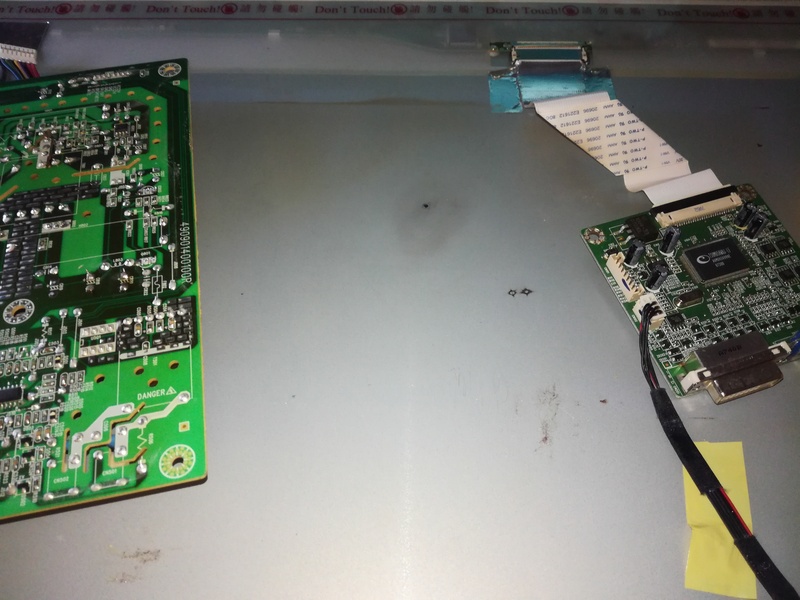 Annoyed with the outcome, I powered it down and just disconnected the tiny board, just to find that the monitor would no longer turn on, so the monitor was apart again to troubleshoot, and this is where it all went downhill. I had everything connected ready for power and plugged the monitor back in, followed by a big bang and flying sparks and all the upstairs sockets and lights went out. 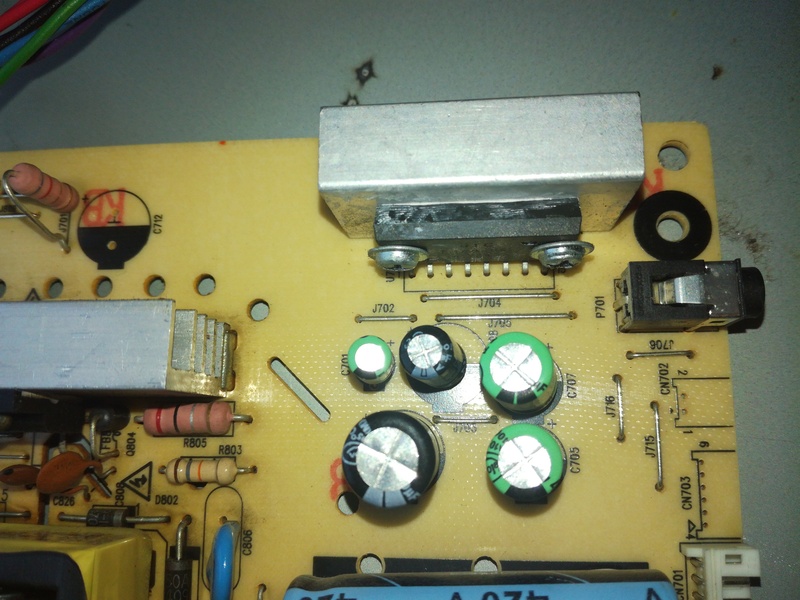 Yes, derp me I had the power board PCB sat on the back of the panel..
R805 Resistor had black on the pcb side where it made contact with the panel and what i think is a heatsink (bottom right of images) is another point of contact. Just going to harvest the components and put them into my electronics bit box and be done with it.